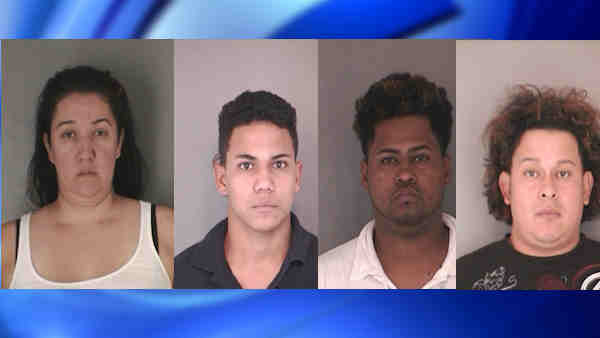 HEMPSTEAD, N.Y. (WABC) -- Police on Long Island arrested four people they said are responsible for a string of robberies. On Thursday and Friday, police arrested Juan C. Vallecillo, 33, of Roosevelt; Cecilia Vallecillo, 36, of Roosevelt; Jaime R. Machado, 28, of Hempstead; and Henry Armando Hernandez, 18, of Hempstead. Police accuse them in seven robberies, usually armed, of delis and convenience stores in Hempstead, Uniondale, Baldwin and Rockville Centre. The robberies took place between Aug. 2 and Sept 9. All four are charged with several counts of robbery. They were scheduled for arraignment on Saturday in Hempstead.